What began in 1922 as an adjunct to the annual Fiesta celebration has grown to become the world’s largest, most prestigious independent Native American arts market, and one of the biggest annual cultural events in the Southwest. Now, it is difficult to believe it ever fit inside one building. 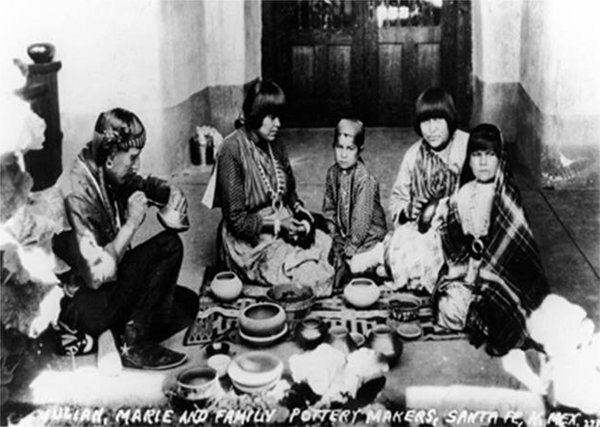 In the early 1900s, Native American arts and crafts were sought after by travelers and traders for souvenirs and curios. They wanted something small enough to fit in their travel bags and suitcases. This level of collecting served to endanger the value and craftsmanship of Native art. Well-known archeologist and anthropologist Edgar Lee Hewett, whose studies focused primarily around the Native cultures of the Southwest, was a prominent figure in support of the preservation and conservation of the cultures’ traditional art forms and prehistoric dwelling ruins. 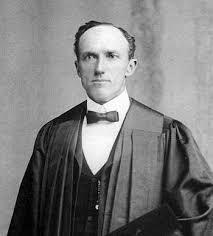 In 1909, he founded and directed the Museum of New Mexico. Museum curator and assistant director Kenneth Chapman worked closely with Hewett and saw the need for educating the public at large on the value of genuine indigenous Southwest arts, if appreciation for the genre was to be sustained. Hewett, Chapman and the Museum of New Mexico collaborated with the Indian Arts Fund and the New Mexico Association on Indian Affairs to create a juried exhibit of traditional Indian arts. It was to be held in conjunction with the long-established annual Fiesta celebration. 1922 Indian Market Display with Award Trophies. Palace of the Governors Armory Building. Photo: Palace of the Governors Photo Archives. The first exhibit opened on September 4,1922, under the title of The Southwest Indian Fair and Industrial Arts and Crafts Exhibition and was more colloquially known as The Indian Fair. While the Fiesta celebrations took over the Plaza, the entire Indian Fair exhibit was displayed in the National Guard Armory Building, behind the Palace of the Governors. Admission fees were charged to the visiting public. 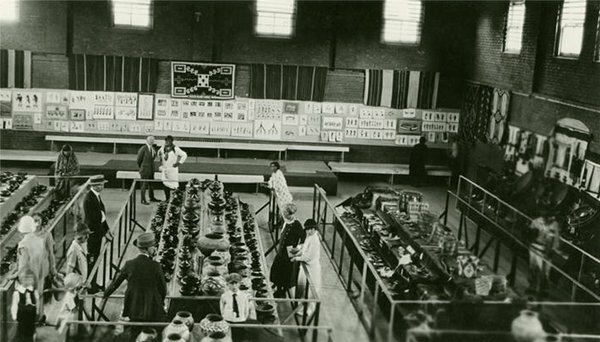 1922 Picuris Pueblo Pottery Exhibit. Palace of the Governors Armory Building. Photo: Palace of the Governors Photo Archives. 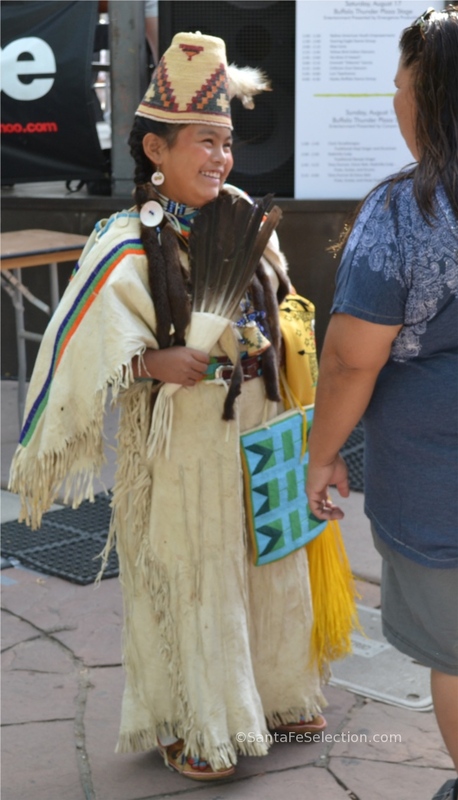 Events included the display of Native American dancing, singing, Native dress, and demonstrations on jewelry, pottery making, and bow and arrow contests held on the museum patio. Indian Fair 1922. Patio of the Palace of the Governors. Kenneth Chapman center with Santiago Naranjo. Palace of the Governors Photo Archives. A handful of museum curators, including Chapman, judged the various categories, which were named for each of the participating pueblos. Each category was awarded a first prize of $5 and a second prize of $3. There was also a $15 prize and a trophy awarded for “Best Tribal Display”. The Museum staff acted as intermediaries in selling the art to the public. The artists received their money after the Fair was over. For five years the Indian Fair remained in the Armory and the Palace of the Governors courtyard patio during Fiestas. 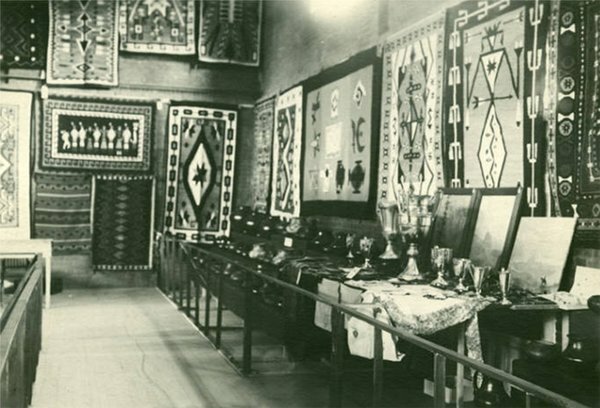 1925 Indian Fair in the Palace of the Governors Armory Building. Photo: Palace of the Governors Archives. 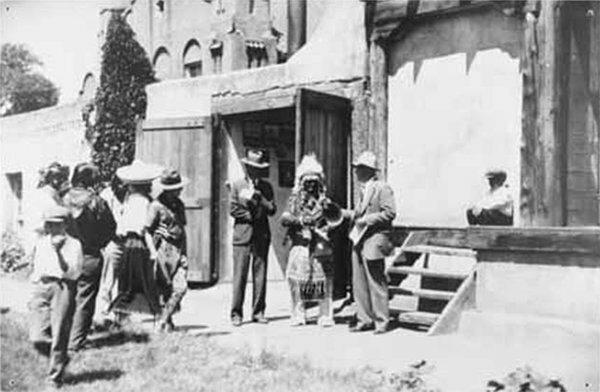 In 1927, the Museum of New Mexico ended their involvement with both the Fiesta and Indian Fair events. Kenneth Chapman founded an independent committee to continue supporting the advancement of traditional Native arts and the Fair. The Southwest Indian Fair Committee included Hewett and dedicated Native heritage supporters Amelia and Martha White, Santa Claran day-school teacher Lucy Bacon, Dorothy Stewart, Margaretta Dietrich and others. From 1927 to 1931, the Fairs continued to be held in the Armory building and on the patio of the Palace of the Governors during Fiestas. The Committee also provided transport from the pueblos, camping equipment, and food for the Fair participants totaling approximately $400 a year. These costs were covered by admission fees, along with a small percentage added to the sales price of the exhibit items. Committee members would agent the sales of all items and Native participants continued to wait until the Fair was over in order to receive their payment. The average price for a pot was $3. The sale of the now legendary Maria Martinez’ pots would bring as much as $11. At a time when a can of milk cost 10 cents, coffee was 35 cents a pound, and a pair of men’s britches could be bought for $1.75, these earnings were considerable. Maria and Julian Martinez and Family. Palace of the Governors Photo Archive 1929. To ensure display of excellent works, Chapman went to pueblos in advance of the Fair and buy those pots and items he felt represented the best of the art form. He would spend in the range of $400-$470 annually from monies donated by the committee members and other supporters. These purchases also served to increase value and encourage the enthusiasm of the artists to continue their works and high quality standards. After 1931, the Santa Fe Indian Fair stopped. The Committee took the exhibits on the road. From 1932 to 1935, they traveled around the state to Indian schools, pueblos and tribal fairs and held exhibits and competitions that offered prizes. They hoped the exhibits would inspire participation from more artists while displaying what they had judged to be prize-winning examples of traditional art forms. In 1934, the SWIFC were taken over by the Arts and Crafts Committee of the New Mexico Association on Indian Affairs. By 1935, participation by the Native American artists was waning. In 1936, NMAIA President Margaretta Dietrich proposed bringing the Fair back to Santa Fe and again hold it during Fiestas. 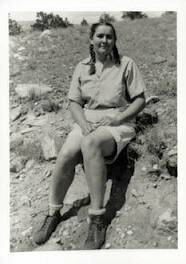 Margaretta’s assistant was a young writer named Maria Chabot. From her years living in Mexico, Maria had seen first-hand the success of native Mexican outdoor markets. 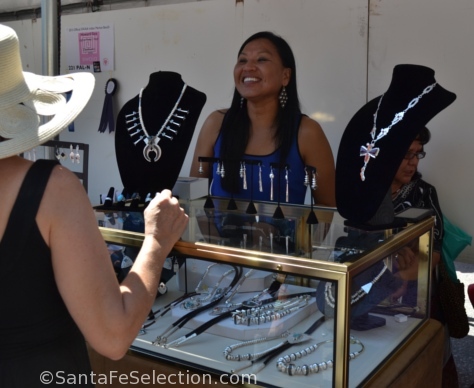 She proposed the idea of a weekly Saturday outdoors “market,” and the Indian Fair was reborn as the Santa Fe Indian Market. It was to be held for eight consecutive Saturdays under the portal of the Palace of the Governors. The minutes of the Association meeting explain her idea. The first of the Saturday Indian Markets was held July 11, 1936. Participation was strong. Seventy-five to 100 people arrived from the Pueblos of San Ildefonso and Tesuque. The artists would do their own selling, thus eliminating the third party and the wait for payment, and allowing for direct connection between vendors and buyers. As the weeks continued, the Market was so successful that the artists would return to sell their work and that of their family members. This caused a spread of displays inching their way down the Palace’s neighboring streets. Although there were many categories of works sold, pottery was one of the most popular. 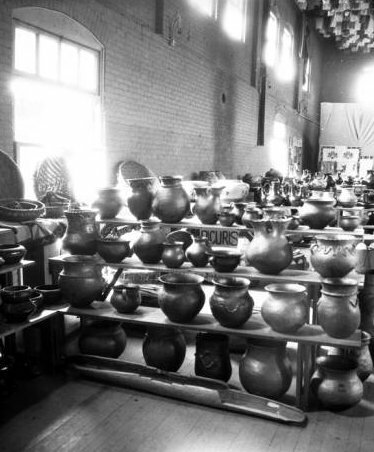 The average weekly sale of pots by such prize-winners as Maria Martinez and Severa Tafoya was $16. Those who were less skilled earned in the range of $4-$6 per week. Public attendance was estimated to be in the range of 8,000 for the entire summer. 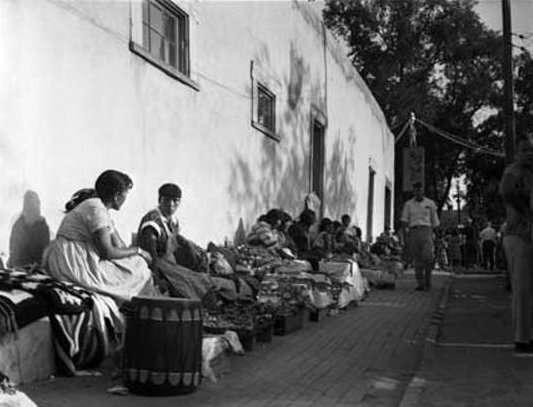 Even after the Markets were over, vendors continued to come to Santa Fe to sit under the portal of the Palace of the Governors. 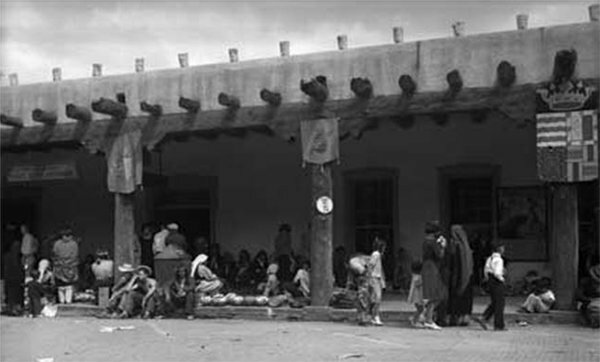 To this day, it is a highly anticipated experience for many visitors to Santa Fe to visit Native vendors and artists under the Palace’s portal. The Saturday markets weren’t held in 1937, but they were resumed in 1938 and 1939. 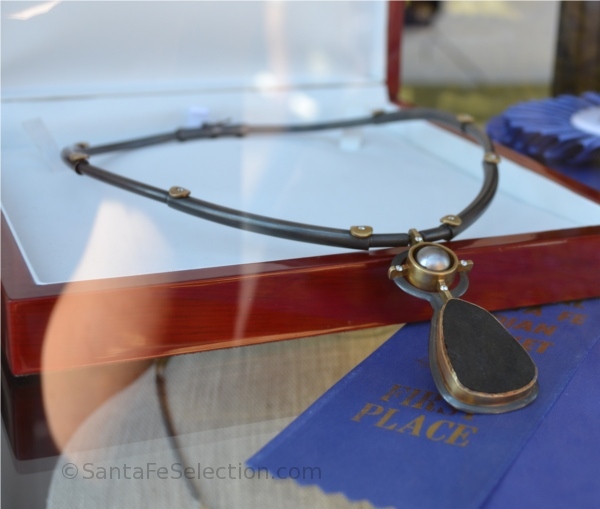 Prize ribbons were awarded for the first time in 1938 and have continued ever since. From 1940 through 1962, the Indian Market was again held during the one Fiesta weekend. All Native American artists were invited, but the spread of displays around the plaza and on shop fronts was a cause for concern and upset among shop owners and the artists themselves. There were no assigned spaces, and the battle for the best spots had some vendors sleeping under the portal to ensure their space. Vendors sleeping under the Palace of the Governors Portal. circa 1940-50. Palace of the Governors Photo Archive. Through the 1940s and 50s, prizes continued to be awarded, but the number of prizes and the monetary awards wavered. 1953 Vendors along Washington Ave. Photo Nat N. Dodge. Palace of the Governors Photo Archives. By 1959, the future of the NMAIA and its organization of the Market was in doubt. Fortunately, Al Packard, whose legacy Packards on the Plaza is now in the process of closing after a successful 75 years in business, took on the cause. Packard and other prominent figures supported the NMAIA in bringing organization to the Market and reviving the juried exhibits and prizes. Efforts became entirely focused around the extensive organization of Indian Market. The 1960s brought a renewed national interest in Native American culture, which helped the cause considerably. In 1962, the Market was held the weekend preceding Fiestas, establishing its independence from any other event. Gradually, throughout the Sixties, more and more rows of booths were installed for vendors so that in addition to the 100 artists under the portal, there was now booth space for an additional seventy-five. 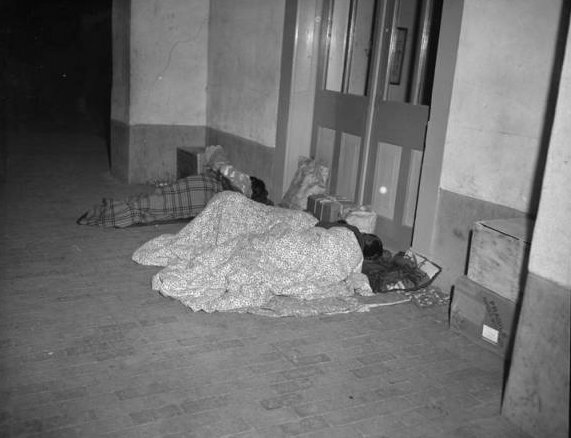 By 1980, 330 booths were provided. In 2002, 625 booths enabled the participation of as many as a thousand artists. Those numbers seem to be holding steady. 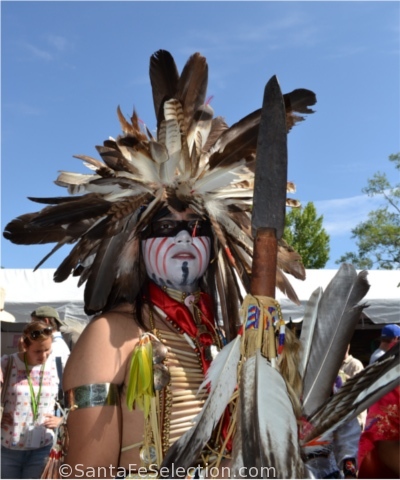 As the 92nd Annual Indian Market draws to a close in 2013, as many as 220 tribes from the U.S and Canada participated, over 600 booths lined the Plaza and surrounding streets, as many as 68 judges determined winners in over 3,600 category classifications and awarded over $110,000 in prizes. More than a thousand artists attended. The white roofs of vendor booths line the streets surrounding the plaza and stretch for many blocks. Artist booths line the Plaza stretching all the way to the Courthouse. Now, the Market is usually held during the third weekend of August. 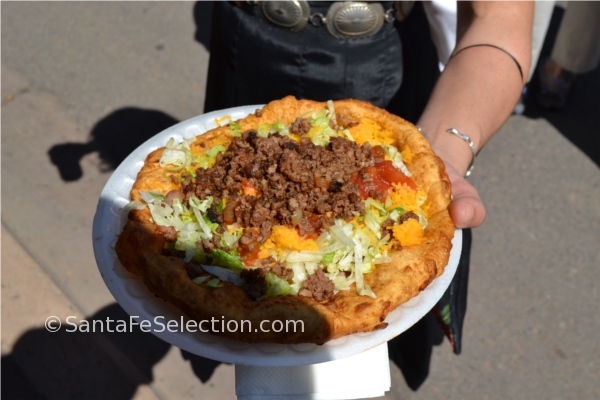 Vendors make their way to Santa Fe from all directions, some of them bringing delicious Native foods to sell to an eager public. As in the past, the participating artists work hard all year to create works that will win prizes and hopefully earn them good income through sales. Cavan Gonzales, Maria Martinez’ great-grandson, has been working on his collection of pots since late last year. He has won many awards over the years, and he relies on the sale of his pots for much of his family’s annual income. The judging process upholds its original rigorous standards of evaluation of excellence in cultural aesthetics, quality and creativity in all of the category classifications. Robin Waynee Saginaw Chippewa Tribe of Michigan. Contemporary Pendant. Robin Waynee is a very popular contemporary jeweler. She is originally of the Saginaw Chippewa tribe of Michigan. She now lives in Santa Fe and her work can also be found at The Golden Eye just off the Plaza. 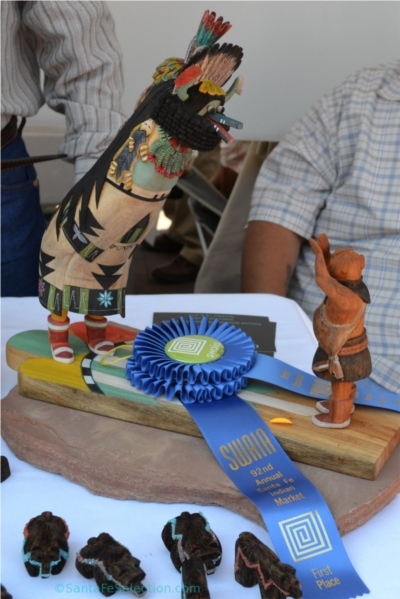 In the Pueblo Carvings Classification, Bart Gasper of Zuni Pueblo won 1st place with this amazing Kachina. 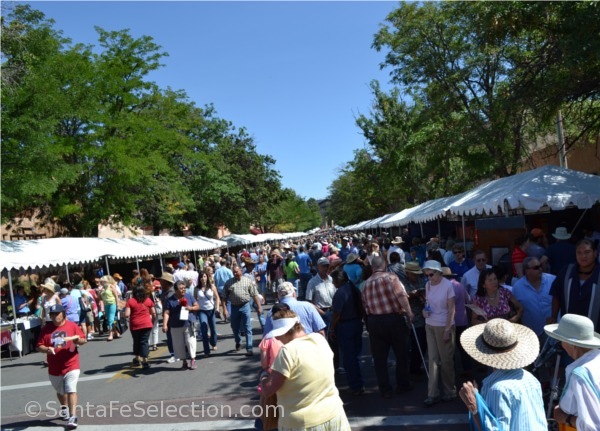 The week preceding the Market includes festivities, fund-raisers, shows and exhibits in galleries and museums, restaurants and cinemas throughout Santa Fe, culminating with the Market on Saturday and Sunday. On Sunday morning an amazing display of traditional and contemporary cultural dress adorns the stage for the Native American Clothing Contest. Judges award prizes for the best in numerous categories. Within Santa Fe’s historic town center, hundreds of Native cultures converge – creating a proud and spectacular display of color and beauty. There is a tremendous amount of history, tradition and religious ceremonial information to be gleaned from each costume. Almost every detail has a purpose and meaning that is intricately woven through complex Native lineages. Audrey Brokeshoulder. Plains Indian Dress. In the above image, Audrey Brokeshoulder’s dress won first place in the category of “Southern Plains Girls Dress” in the age group 11 to 17. I was fortunate enough to be able to ask Audrey’s father Nick about it. Nick designed her skirt and shawl, basing the designs on patterns used by the Oklahoma woodland tribes Sauk and Fox. Every design of the beadwork and stitching has meaning relating to the history of the tribal cultures. Nick says, “you can’t just put on these clothes…they have to belong to your tribe through lineage, or [you need] to be adopted into these groups by families willing to allow you the rights to wear them…” Audrey is an enrolled member of the Hopi tribe, and her heritage includes Navajo (Dineh) and Shawnee. 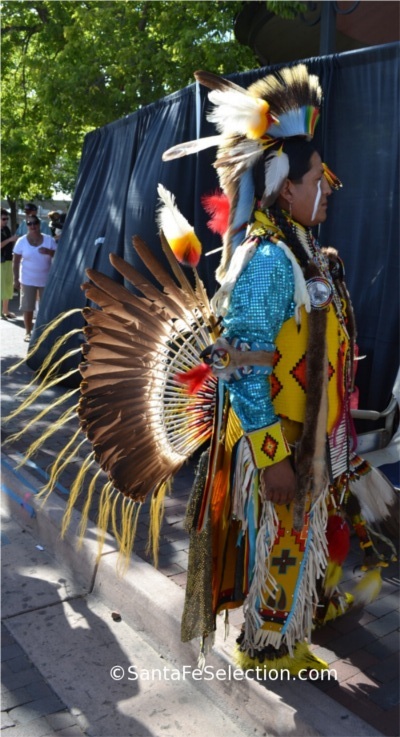 As in all of the works of art at the Indian Market, the costumes are a fantastic display of color, meticulous beadwork, feathers, shells, bells, and beauty, all representative of important traditions in each of the Native cultures from around the U.S and Canada. Laura Marks: Yakama Traditional. Category: All Tribes – Girls ages 6 – 10. 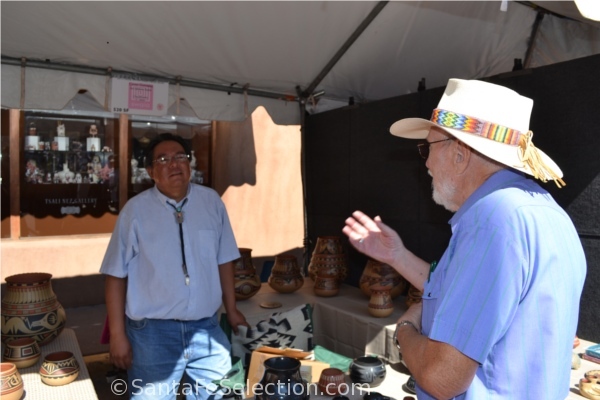 There are commercial buyers, tourists, private collectors and enthusiasts who have journeyed to Santa Fe for over 50 years to collect and connect with the Native artists and their culture. 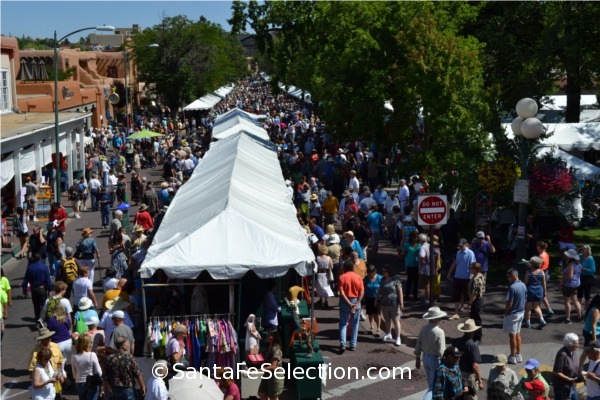 Santa Fe’s Indian Market now attracts over 150,000 visitors from around the world. 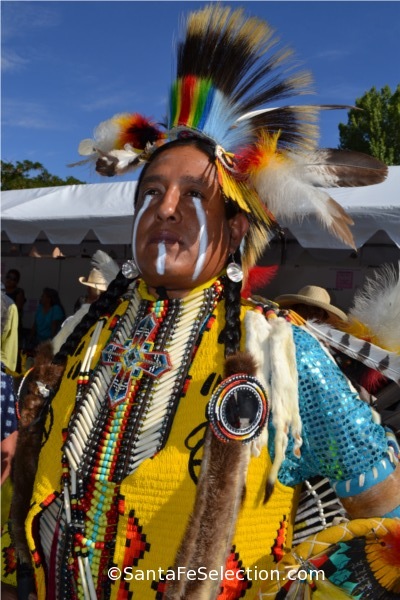 The dedication of the non-profit Southwestern Association for Indian Arts has paid off as they continue to work tirelessly to develop educational and training programs in support of Native American art and culture. They also hold a smaller, indoor Winter Indian Market each year around November 30 through December 1st. Indian Market is a spectacular event and something everyone should experience. If you’re thinking of visiting, remember to book your accommodations far in advance. There is nothing like it anywhere else, and it surely is well worth planning the trip! This entry was posted in All Posts, Day Trips, Fashion, Museums, Shopping, Special Events, The Arts, Things To Do by Maria Johnson. Bookmark the permalink. Tremendous article with great photos. Excellent work! Outstanding article. I have posted it to our FB page company wide as it really does tell the story.